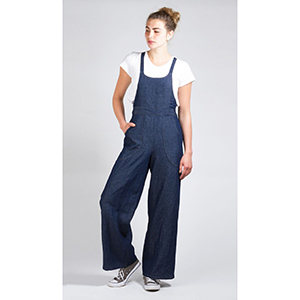 The Burnside Bibs are not your traditional work overalls. Yes they are comfortable and easy to wear, yet they are much more stylish and feminine than traditional versions. The straps that transition to narrower ties offer many options for how they can be tied. The Burnside Bibs have two front bib options - a scooped neck or the traditional straight front. Both bibs work with either version #1 or version #2. Version #1 is a more fitted back pant with back waist darts and an invisible side zipper opening, however, the ties still form a small amount of gathers at the back waist. 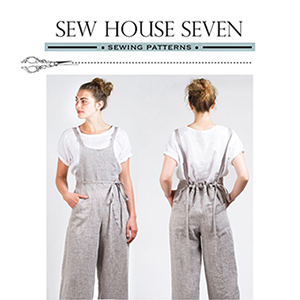 Version #2 is a looser back pant that slips on over your hips and does not have a closure to sew. This version is fuller and more gathered in the back. 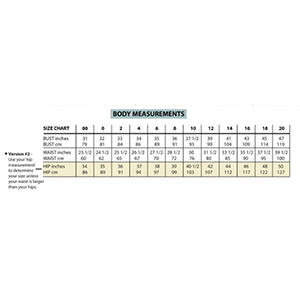 Use your hip measurement to determine your size for version #2. Suggested fabrics are cotton jersey, ponte de roma, tencel spandex, denim or linen.